Sea, Sand & Sky: Day on the Island Clam Seeding! On Wednesday, Bridget took a couple of us to Thompson Island to clam seed. At first, everyone was wondering, "What is clam seeding?" I was confused and didn't know what it was about, but I still wanted to try it out. On my way to Thompson Island, all I was thinking about was, "Am I going to get dirty?" Trying new things out is a great experience. When we got to Thompson Island, the workers were there waiting for us to arrive. There were people from different parts of Boston at the clam seeding event. So we went on the beach because we had to plant the clams when it was low tide. We got a huge net to cover the spot on the ground where we are going to dip. We started to dig the sides about 1-2 inches deep. Then we buried one side of the net. After, we flipped the net over and started to rake to find green crabs because they would eat the clams. After we raked, we laid the clam seeds down. Then, we laid the net over and buried all the sides down. 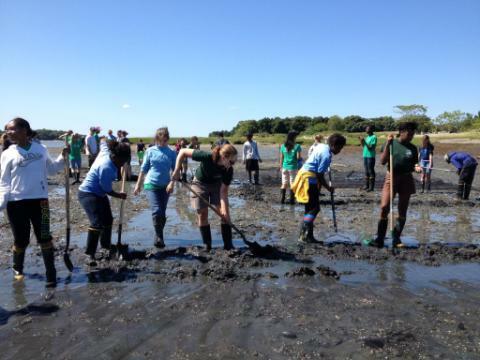 It was actually fun because I never got to do something like planting clam seeds before.